There is an old saying that age is just a number. Edwin Thulo Mahlatsi, from Bothaville in the Free State, fully agrees with this statement. At the age of 75, he became the 2017 Grain SA/Absa/John Deere Financial New Era Commercial Farmer of the Year – which just proves that success can come at any age. Being a farmer at heart, Edwin had to work hard to realise his lifelong dream of becoming a commercial producer. He was born on 2 August 1942 on a farm in the Bothaville district. Both his parents were farm workers and after passing Grade 6 he started working on the farm as well. When the farm was purchased by Frikkie Rautenbach, Edwin stayed on as a farm worker. He says Mr Rautenbach bought him with the farm. In 2012, his employer helped him to obtain a lease agreement on a farm through the government’s Proactive Land Acquisition Strategy (PLAS) programme. The 463 ha farm, Swartlaagte has 208 ha of arable land with 255 ha of grazing. Rautenbach subsequently made farming equipment, a tractor and inputs available to Edwin on a barter deal. Unfortunately, Frikkie passed away in 2014 and the equipment was put into the estate. Edwin was left with no work, no implements or income and no production capital. This is when he became a member of Grain SA and enrolled in the Grain SA Farmer Development Programme. He joined the Bothaville Study Group, attended farmers days and has completed several training courses which include ‘Introduction to Maize Production’ and ‘Farming For Profits’. Edwin is full of praise for the Grain SA team as they assisted him to make the most of his 210 ha of good, arable soil. They also supported him to get government funding and showed him how keeping up with the latest farming techniques and agricultural technology can aid him to achieve better results than in the past. On Swartlaagte teamwork is important and early morning briefing sessions are held to plan the day’s activities. Thulo’s daughter, Doreen, is also part of this farming enterprise and together with local farmer and Grain SA mentor, Christiaan Bouwer, they tackled the challenging 2015/2016 season. 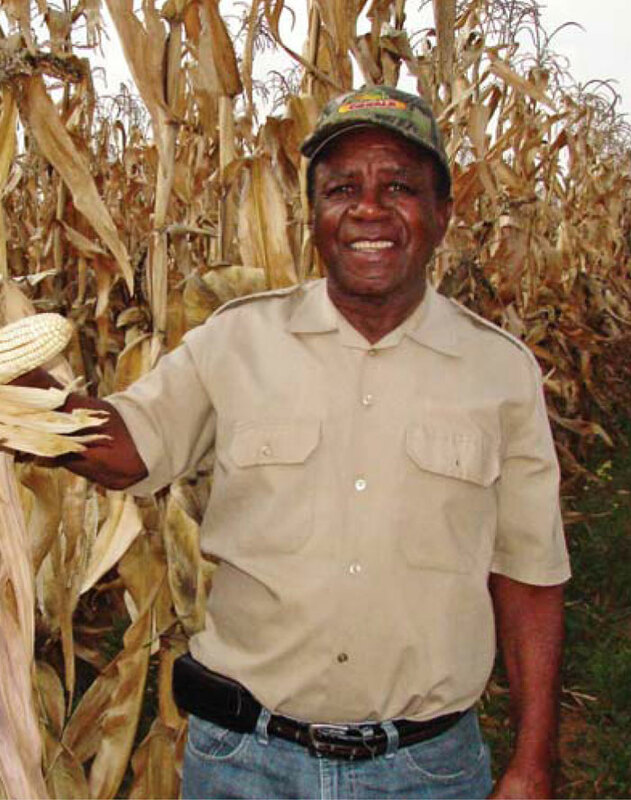 Despite the severe drought Edwin still managed to harvest 250 tons of maize. This year, he has yielded a substantial 5 and a half tons/ha. It was in deed a festive occasion with Adam, Edwin’s son, taking time out of the office to be with his family. Edwin was part of the 2015/2016 Recapitalisation Project managed in partnership with the Department of Rural Development and Land Reform and Grain SA. The grant he was given enabled him to purchase the necessary implements. With his own equipment, he is able to do timely soil preparation, spraying and planting with only the harvesting done by a contractor. Soil analysis is done and used as a departure point for production. The review panel, who visited his farm in 2017 described Edwin as a very knowledgeable man who has a passion for agriculture. Edwin received his award as the 2017 New Era Commercial Farmer of the Year at the Grain SA Producer of the year function held on 13 October 2017 in Johannesburg. Mr Johan Kriel (Development Co-ordinator, Grain SA) who was the interpreter during Edwin’s acceptance speech said that Edwin and his family are phenomenal people. Mr Danie van den Berg (Development Co-ordinator), who evaluated this passionate farmer mentioned that Edwin has farming running through his veins. He has been involved in farming from a very young age and was coached and trained by a well-known farmer in the Bothaville district for a period that spans over 40 years. Edwin is motivated by the dream to be successful and he says that the accumulation of knowledge about agricultural practices is one of his strong points. The fact that he is blessed with good health and a wonderful support system, not only at home and in his own community, but all over the agricultural sector. He hopes to make a difference in the lives of people and animals who are hungry and suffering for many years to come. With Grain SA’s help this 75-year old farmer bought himself a brand-new Isuzu bakkie in 2017 – it is the very first new vehicle he has ever owned! This goes to show you are never too old to dream, because dreams do come true, no matter what age you are! This month’s edition of The Corner Post was written by Louise Kunz, Pula Imvula contributor. For more information, send an email to louise@infoworks.biz .